This year I was getting married. 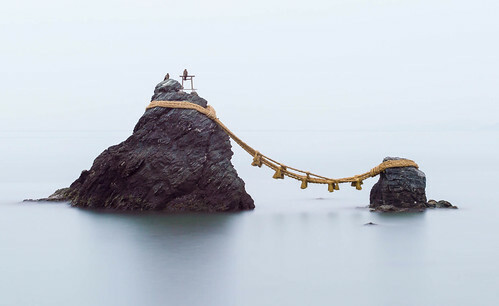 That's why I decided to pursue a pilgrimage to Meoto Iwa's married rocks. This place is not straightforward to reach: it took several hours from Osaka, using multiple trains and busses. When I arrived there, it was getting dark and I had just a few minutes to set up the machine, the tripod, the focus, the ND filter, and the intervalometer. This photo was the second and last take, and I still wonder how those big birds managed to stand still for exactly 2 minutes.